In the blog on East-West Dominance, we talked about taking power to the edge. But where is this ‘edge’? In order to answer this question, we need to clarify how we understand what an enterprise ‘is’ before we can say where its edges might be. the particular domain of relevance within which the enterprise is working can be distinguished, defined implicitly by the behavior of the enterprise (we would expect a street theater to engage with its audiences in a different way to an opera house). 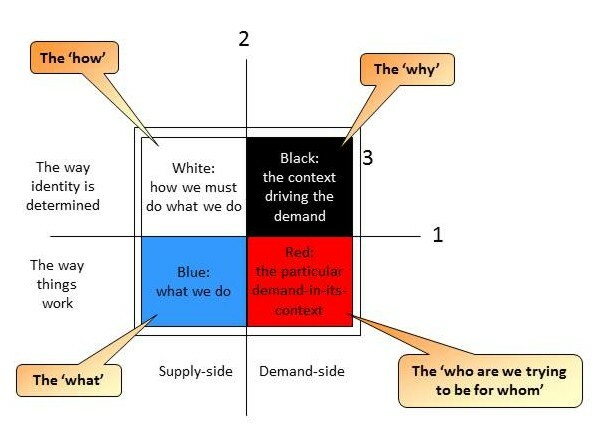 This gives us the what, how, who/m and why in the picture below, and the questions we can ask of any enterprise: what does it do (blue), how does it organize these activities (white), who are its clients for this work and who is it trying to be for them (red), and what is driving the need for this demand from them (black). We can represent this foursome in traditional hierarchical form, with each layer acting as the context for the layer below it. 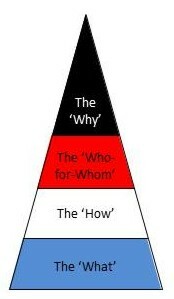 Put in this form, the ultimate (black) assumptions about the ‘why’ are held at the top of the hierarchy, and imply the presumption of a symmetric relation to demand. This means that the enterprise as a whole assumes that it can know at ‘design-time’ what it is that it is going to do for its clients/customers at ‘run-time’ – a presumption of symmetry between what the enterprise is prepared to do and the forms of demand that it is prepared to recognise. So what happens to all of this when the demand is asymmetric? An enterprise encounters asymmetric demand when the actual demand being encountered is in some way different to what is being offered symmetrically. This creates a value gap from the point of view of the client/customer which can only be filled if the supplying enterprise is able to respond to the particular nature of the demand being presented. Obviously there are limits not only on the extent to which this value gap can be reduced, but also to whether the enterprise wants to reduce it. But insofar as it does, the principle is that the relationship to demand, rather than being generalised across client/customers (and therefore treated as symmetric to the supplier), has to be treated as particular to individual clients/customers within their respective contexts-of-use. This requires a different form of response from the enterprise. 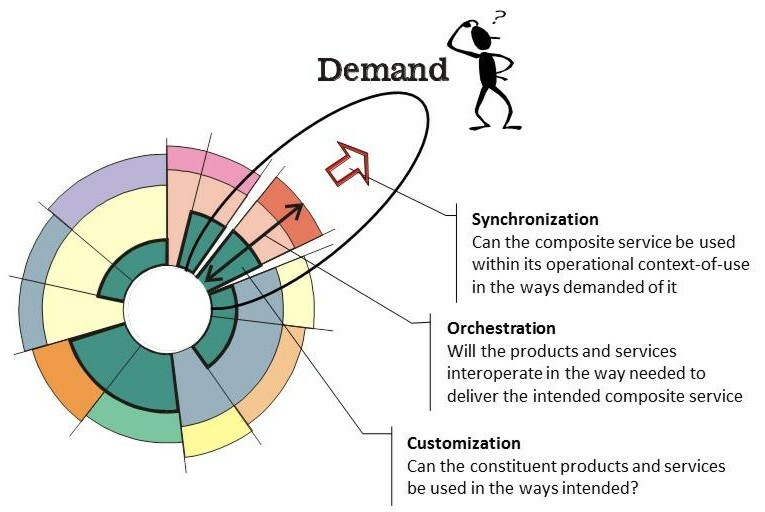 Demand has to be understood as arising at the ‘edge’ of the enterprise where the demand is encountered. The particular way the enterprise responds (i.e. the what, how, who/m and why of the response) therefore has to be particular to the demand rather than the same across all demands. This requires a form of hierarchy with its own particular arrangement of layers relating to the particular demand at the edge. To make this possible, power has to be moved from the centre to the edge, so that effective forms of governance within each local hierarchy are able to align what the enterprise does to the particular local demands being responded to. How can this be practicable for the enterprise? Understood in this way, taking power to the edge involves enabling a ‘wedge’ to align products and services to the particular demand at the edge, with each ‘wedge’ enabled to make its own assumptions about the way it holds the what, how, who/m and why in relation to each other. With a symmetric relation to demand, the general assumptions made by the center about the black-blue (North-South) relation dominates the way white (West) can organize the relation to red (East). But an asymmetric relation to demand has to reverse this, with the red-white relation leading, the black-blue relation being aligned in support of each particular demand. This is the East-West dominance spoken of earlier. So where is the edge? Wrong question. In an asymmetric world, the question is where do you want to find your edge? This is a question of what forms of competitive advantage the enterprise can create in how it relates to particular demands.